Human sacrifices have been practiced for thousands of years by many cultures in the world, including the Chinese, Carthaginians, Celts, and ancient Hawaiian cultures. It is also known of human sacrifices in indigenous peoples and cultures of pre-Columbian America, such as the Olmecs, Teotihuacans, Mayans, Toltecs, Aztecs, Muiscas, Mochicas, and Incas. In the Inca Civilization the Capacocha was practiced, it was a ritual in which children were sacrificed; can be translated as “real obligation”. For the Incas, death was the beginning of another life, the chosen ones for the sacrifices were boys and girls, who were considered pure, these had to belong to good families, generally they were children of caciques. The historian Carmen Martín, indicates that they were carefully chosen children of great beauty from all over the empire; with respect to age, they were between 6 and 8 years old, although they could also be older. He reports that “death came to them without pain”, they felt nothing probably because they were drugged with coca leaves or chicha, and when they were deeply asleep, they were exposed to very low temperatures in the summits of the glacial mountains and they died frozen. In Llullaillaco volcano in Argentina, the bodies of 3 children, two 8 years old, one 12 and a 15 year old girl were found. The children dressed in a sumptuous manner, unlike the girl, who was probably buried with them to take care of them.” This destiny was imposed from birth and accepted by them as a duty. These children, considered pure beings, were bearers of the messages of their people. For this ritual they prepared months in advance and wore jewels and fine clothes. Once in place, the children were intoxicated, then died frozen, killed by strangulation, or with a heavy blow to the head. Then they were accommodated in an underground well, luxuriously dressed, with personal adornments, fabrics, food and a series of articles of daily use. Other studies point out that some of the ritual massacres in the Andes range back to pre-Inca times, but their numbers and sophistication increased with the expansion of the empire from its capital Cusco. These studies indicate that Capacocha (sacrifices of children) was used as a means of social control. According to these, the tombs acted as warnings designed to instill fear in the conquered peoples. Juan de Betanzos, a 16th century Spanish chronicler, wrote that the Inca Pachacútec had a large number of children buried alive as an offering at the end of the remodeling of the Temple of the Sun. He also writes that when the Inca died, a thousand children were buried with him and a thousand girls between 4 and 5 years. The chronicler of the time Bartolomé Álvarez, narrates that some very young women destined to Capacocha, accepted their destination with pleasure, but those who did not wish to die, were drugged or intoxicated and then sacrificed. In 1639 the priest Barnabas Cobo wrote “they were killed by strangulation on a rope, sometimes they were drunk before being killed”. In 1572 Pedro Sarmiento de Gamboa, I affirm that on the “Capacocha” party, children were immolated before the idol of Huanacaure; finally Guamán Poma de Ayala (16th century), wrote that the Capacocha was a celebration held twice a year, in which children were sacrificed. However, we have to take into account that many Spanish chroniclers, tried to justify the crimes and the devastation of the invasion, giving the Inca civilization a bad reputation, showing the Incas as murderers and sacrificers of children. According to the chroniclers Tanta Carhua was a 10-year-old natural child of Ocros, who was offered by his father in exchange for being named cacique. After being taken to Cusco where she participated in the celebrations of worship of the Sun and the Inca, the girl returned to her native town in the company of notable representatives of her people. Dressed like a princess ascended to the top of the mountain, she was numbed with a special drink and placed in a hole about 3 meters deep, which was then sealed. Among those who witnessed the event was the girl’s father, who was converted into a cacique by the reigning Inca, as retribution for having given his daughter. It is known that approximately in the year 1540, the volcano Sabancaya erupted, and the locals to placate the wrath of the volcano offered 3 live girls as a sacrifice. These had to be worshiped by the people of the place for some years, but with the passage of time they fell into oblivion, perhaps because it was very difficult to ascend to the mountain of more than 6 thousand meters of height. Already in recent times (1990) the volcano would return to activity, which left exposed Inca remains. In the excavations that were made several feet deep was found a surprising discovery, a funeral bale in which the body of a frozen girl, who was later baptized as the Juanita Mummy, was found in the fetal position and covered by a blanket. Near her were 2 other girls found, and it is probable that they were also part of the sacrifice. In 1999 at the summit of Llullaillaco Volcano, the American archaeologist Johan Reinhard found the intact bodies of 2 girls and 1 child whose organs were intact; so much that even was found rest of blood in the heart and the lungs, besides rest of food in its digestive organs. The gentle expression of their faces suggests that they did not suffer at the time of his death. Possibly they were drugged before being sacrificed. More than 50 years ago, Chilean muleteers discovered the frozen body of a child on one of the highest peaks of the Andes Mountains, in front of the city of Santiago. The news traveled the world. 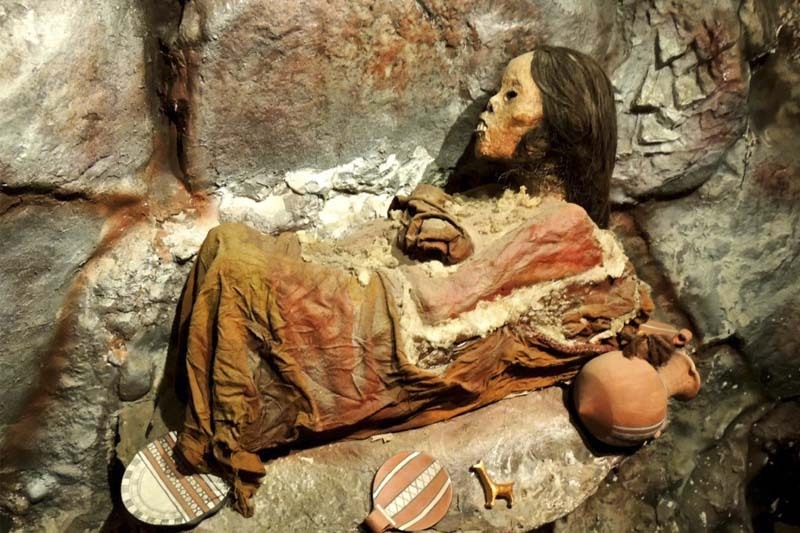 At that time, the Mummy of Cerro El Plomo, was the archaeological discovery realized at greater height (5 400 msnm). The body of the child was in perfect state of preservation, due to the fact that it remained buried permanently in the frozen soil, thus preventing its decomposition. The Inca culture covers many aspects. Its beautiful architecture still amazes us with jewels like Machu Picchu. Do not wait any longer and know the Inca wonder. For more information about the trip to Machu Picchu, please contact us at info@boletomachupicchu.com.